Senior Extension Associate Tim Martinson received the CALS award for Outstanding Accomplishments in Extension and Outreach at the CALS Research, Extension and Staff Awards ceremony November 3. The award “recognizes individuals who have demonstrated leadership in developing a highly innovative and responsive extension/outreach program that addresses stakeholder needs. 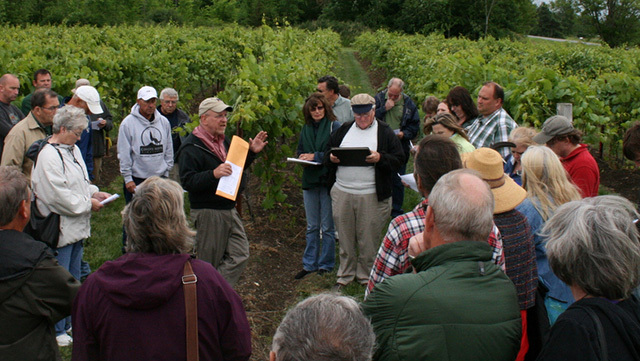 The Awards Committee cited Tim’s leadership in developing and promoting sustainable viticulture practices, which has been recognized throughout New York and has served as the foundation for extension programs in other states as well. They also noted the significant economic and environmental benefits that have accrued to New York’s grape industry as a result of his educational efforts. Those efforts include Appellation Cornell and Veraison to Harvest newsletters and the Northern Grapes Project. Martinson talks with growers at field day.